Reference number for this case: 1-dec-54-Bassoues. Thank you for including this reference number in any correspondence with me regarding this case. This case was apparently first reported in 1966 by Jacques Vallée, in his UFO landings catalog. Vallée indicated that on December 1, 1954, early in the morning, at Bassoues in the Gers, an oval light, very bright, illuminated the countryside. After a few maneuvers and swings in the open air, it had "landed for a few minutes, about 2.5 kilometers from the witnesses," and then flew away to the east. This summary, for which Vallée gave no source, was later republished in several magazines and books, and in 1972, Lumières Dans La Nuit magazine cited it as a case to be investigated or re-investigated. Thus, in #126 of this magazine, in June 1973, a report on the case by ufologists of the LDLN group of Mont-de-Marsan was published. At 4:30 or 5:00 o'clock - his wife said he used to get up early - in December, he saw a yellowish fireball coming from the opposite horizon and then going down behind the hill in front of him, on the top of which is a farm. Mr. Paysse had called his wife who had come to join him, as well as his 9-year-old daughter and the servant. When the globe of fire descended behind the hill, only its glow remained, making the farm contour appear against the light. His wife and daughter went back to bed, while he stared at the glow. About two minutes later, he said, "That's it, it's leaving!" and the other witnesses came back. The fireball rose diagonally, very rapidly, to the southwest, in the very high clouds which it all enlightened, then disappeared by gradually decreasing. The ball arrived from the horizon, opposite of the witness. It went down behind the hill. It followd this departure trajectory. There was no trail, there was no change of color, no change in brightness. It was a moonless and very dark night. The investigators indicate that at the time, the gendarmes investigated, visited the surrounding farmers, but finding no other witnesses. 191. Dec. 1. In Bassoues (Gers) an oval light, very bright, illuminated the countryside early in the morning hours. After some maneuvering and oscillations in mid-air it landed for a couple of minutes, about 2.5 kilometres away from the witnesses, then flew away to the East. Dec. 01, 1954, 04:30, Bassoues (France). A 39-year-old civilian saw an oval light, very bright, illuminating the countryside. After some maneuvers and oscillations in mid-air, it landed for a couple of minutes less than 3 km away, then flew off to the east. (Personal). # 190. December 1st. In Bassoues (the Gers), a very bright oval light illuminated the countryside at the first hours of the morning. After some maneuvers and oscillations in the air, it landed for one or two minutes at about 2 kilometers and a half of the witness, then took off to the east. In a list of cases in France in 1954 which should be reexamined because they lack an investigation, the magazine indicates the case of Bassoues on 12/1/54. The Vallée catalog published in "LDLN" and Contact [Contact Lecteurs, supplement to LDLN], mentions an observation filed under number 346. The date: December 1st, 1954, at 4:30. The place: Bassoues (32) 34 km from Auch. It is a small picturesque village built on a ridge of hill (255 m) between the valleys of the Guisoue and the Luzoue. It remains in particular a magnificent square dungeon of the XIVth of a great purity of line, flanked by big diagonal buttresses and high of 38 m, which was part of an important castle of the Archbishops of Auch. In the church: sarcophagus of Saint Frix wounded to death while fighting the Saracens on the Etendard plateau in 732, XVth century pulpit. The road passes under the old wooden hall which occupies the center of the village. At the exit of the village a small road winding between the hills, leads us to the farm of the witness of the observation: Mr. Paysse, solid Gers resident, who was 39-year-old in 1954, is very nice and he tells us with simplicity and very calm, what he saw 18 years ago but remembers very well. He was not the only witness, his wife, his daughter (who was about 9-year-old at the time) and a servant. - "It was 4:30, 5:00, it was in the month of December". "My husband," said Madame Paysse, "gets up early." - "The latter adds, while looking through the window of the room (on the 1st floor): "I saw a fireball, it came from the horizon, in front of us, then, it went down behind the hill opposite, on the top of which is a farm. (See photo: 1 - The ball arrives from the horizon, in front of the witness 2 - It comes down behind the collin 3 - Departure trajectory). "I had called my wife who had come to join me with my daughter and the servant. When the yellowish-colored globe of fire descended behind the hill, we could see only the glow that made the farm appear, backlighted. My wife and daughter had gone back to bed, while I was watching the glow. Then, about two minutes later, I said, 'That's it, it's leaving!' (The other 3 witnesses had returned). It climbed diagonally, very quickly to the SW in the clouds that were very high and were all lit up. It disappeared gradually decreasing." There was no trail, there was no change in color or brightness. It was a moonless and very dark night. A gendarmerie investigation was made at the time. The gendarmes visited the surrounding farmers, but could not find any other witnesses. This region is extremely hilly, the farms distant from each other; there are many hills to graze. The year 1954, which is a typical example of a wave of observations, deserves to be thoroughly studied in order to understand what happened. If one in two investigators were to do a single investigation this year, the work would be finished. Help with this study. In connection with another observation in the Gers, a reader mentions an observation in Bassoues, the case #346 of the Vallée catalogue. The two authors indicate that in Bassoues in the Gers, on December 1, 1954, within 3 kilometers in the east of the village, a 39 year old man saw an oval light appearing, very brilliant, who illuminated the area. After some operations and oscillations at average altitude, a craft landed. It remained two minutes on the ground, then took off in direction of the east. They indicate that their source is the Vallée catalogue and that the information is very brief. The two authors indicate that on December 1, 1954, Mr. Paysse was looking through his window of the story and saw a sphere of luminous fire of yellowish color. "When the sphere of yellowish color descended behind the hill, you did not see any more the gleam which revealed a farm with back-light. My wife and my daughter went back to bed while I remained there to look at the gleam. Then, two minutes afterwards approximately, I said: "That's it, it sets out again!" The three other witnesses came back, it rose in diagonal, very quickly, and disappeared gradually." The authors note that an investigation by the gendarmerie had been done at the time, but did not find other witnesses. The authors indicate as source the case 346 of Jacques Vallée's catalogue and an investigation by the LDLN ufology group of Mont-de-Marsan published in LDLN #126 on page 13. The Belgian ufologist indicates that in 1954, on December 1, in France, in Bassoues, at 04:30 Mr. Paysse, 39 years old, saw an oval light, very brilliant, illuminating the area. After some operations and oscillations at average altitude, it lands during 2 minutes at less than 3 km then took off in direction of the east. "Case nr09 12/01/1954 p.213 (Bassoues)"
It is noted further that the case had 4 witnesses. Jerome Beau indicates that on December 1, 1954 at 4 hours 30 in Bassoues in France a 39-year-old civilian sees an oval light, very brilliant, illuminating the area. "After some manoeuvers and oscillations at average altitude, it lands during 2 mn at less than 3 km, then takes off in direction of the east." Luc Chastan indicates that in the Gers in Bassoues on December 1, 1954 at 04:30 hours, while looking by the window of the second floor, the first witness saw a luminous ball which came from the horizon. He called his wife, his daughter and the servant. They then observed a yellowish sphere of color which went down behind the hill. The gleam revealed a farm, backlit. Two minutes later the object went away and rose in diagonal very quickly, disappearing gradually. The website indicates that on 1 December 1954 at 04:30, in Bassoues, France a 39-year-old civilian saw an oval light, very bright, illuminating the countryside. After some maneuvers and oscillations in mid-air, it landed for a couple of minutes less than three kilometers away, then flew off to the east. The website comments that "An object was observed. Occupants of the craft were seen. One oval object was observed by one male 39-year-old witness for two minutes." The sources are indicated as Bowen, Charles, The Humanoids: FSR Special Edition No. 1, FSR, London, 1966; Vallee, Jacques, Computerized Catalog (N = 3073); Vallee, Jacques, Challenge to Science: The UFO Enigma, Henry Regnery, Chicago, 1966; Vallee, Jacques, A Century of Landings (N = 923), (in JVallee04), Chicago, 1969; Schoenherr, Luis, Computerized Catalog (N = 3173); Hatch, Larry, *U* computer database; Author, Redwood City, 2002. 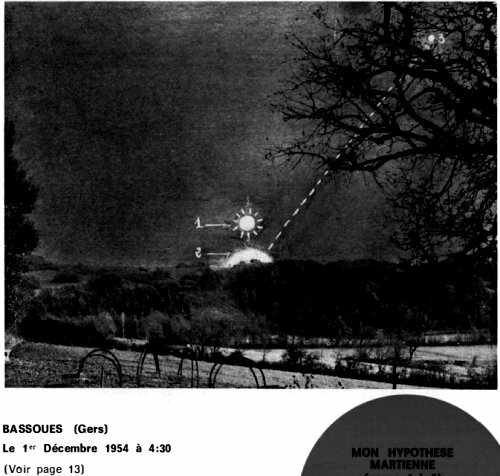 *Dec. 1, 1954 - At 4:30 a.m. a 39-year-old civilian saw a very bright oval light in Bassoues, Gers, France. It was illuminating the countryside. After some maneuvers and oscillations in mid-air, it landed for a couple of minutes less than three kilometers away, and then flew off to the east. (Source: Jacques Vallee, Passport to Magonia: A Century of Landings, case 346). LDLN refers to a gendarmerie investigation. On the GEIPAN website, it is not published as of today. I noticed that when a case's witnesses names are publicly known, GEIPAN does not publish the possible gendarmerie report on that case. The observation is not of very high strangeness, but has no obvious explanation for me. The least worse would be that of a plane, but how would a plane go down in the valley to the point of lighting the farm from behind, then rise back diagonally, all this without changing brightness? One may think of a car's headlights, but then one would ignore then that the yellow ball seems to arrive from above the horizon, and leave high up in the sky, still without change of brightness. I therefore consider this observation as unidentified. [jv3] "Un Siècle d'Atterrissages (suite), by Jacques Vallée, in the ufology magazine Lumières Dans La Nuit (LDLN), France, #104 page 5. February 1970. [ld1] Ufology magazine Lumières Dans La Nuit (LDLN), France, #118, page 4, June 1972. [ld2] Ufology magazine Lumières Dans La Nuit (LDLN), France, #126, page 13, June 1973. 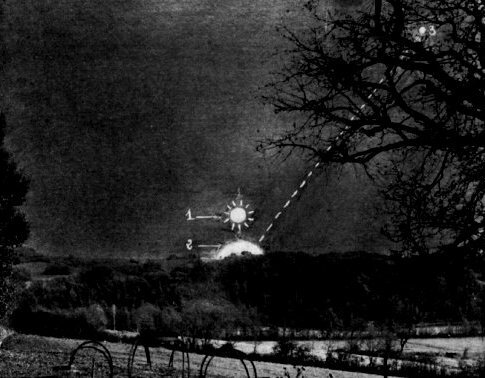 [ld3] Ufology magazine Lumières Dans La Nuit (LDLN), France, #129, page 24, December 1973. [jv2] Summary by Jacques Vallée in "En Quête des Humanoïdes", book by Charles Bowen, French translation of "The Humanoids", J'Ai Lu publisher, page 68, 1974. [gl1] "Face Aux Extra-Terrestres", book by Charles Garreau and Raymond Lavier, Delarge publisher, France, page 163, J'ai Lu, page 165, 1975. [fr1] "OVNI, Premier Dossier Complet Des Rencontres Rapprochées en France", book by Michel Figuet and Jean Louis Ruchon, Alain Lefeuvre publisher, France, page 213, 1979. [nf1] "Catalogue Francat des rencontres rapprochées en France (Listing 800 - 1982) (2 - Suite)", compiled by Michel Figuet, in the ufology magazine Lumières Dans La Nuit (LDLN), France, page 21, #257-258, November / December 1985. [fb3] "Epistémologie de l'Insaisissable", article by Fabrice Bonvin, in the ufology magazine UFOMANIA, France, #29, page 25, May 2001. 0.2 Patrick Gross October 1, 2007 Conversion from HTML to XHTML Strict. 1.0 Patrick Gross December 26, 2008 First formal version. Additions [go1], [ud1], [lc1]. 1.3 Patrick Gross October 19, 2014 Addition [ni1]. 1.4 Patrick Gross November 29, 2016 Additions [jv2], [ub1]. 1.6 Patrick Gross November 24, 2018 Additions [ld2], [lh1], [pr2]. 1.6 Patrick Gross November 24, 2018 Summary changed, was: "On December 1, 1954, at 4:30 a.m. or 6:30 a.m., in Bassoues, the Gers, Mr. Paysse looked by his window on the second floor and saw a sphere of luminous fire of yellowish color. He called his wife, his daughter and the servant. Mr. Paysse stated: "When the sphere of yellowish color descended behind the hill, one did not see any more the gleam which revealed a farm by back-lighting. My wife and my daughter went away to go to bed while I remained to look at the gleam. Then, two minutes later approximately, I said: 'That's it, it sets out again!' The three other witnesses came back, it rose in diagonal, very quickly, and disappeared gradually." There was an investigation by the gendarmerie at the time; which did not find other witnesses. The case then appeared in Jacques Vallée's UFO landings catalogue, then it was reinvestigated by the LDLN group of Mont-de-Marsan who published a report in the "Lumières Dans La Nuit" ufology magazine, #126 for June 1973." 1.6 Patrick Gross November 24, 2018 Explanations changed, was "Not looked for yet".